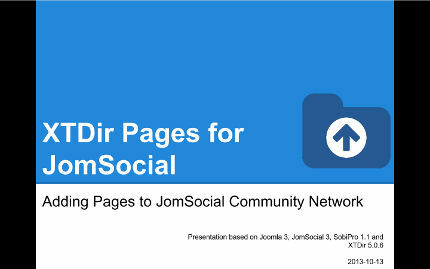 The presentation includes how you can add Pages to JomSocial Community Network, based on SobiPro directory. 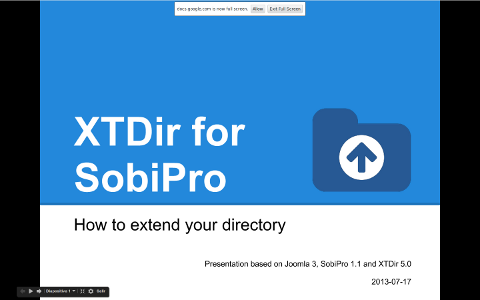 In this presentation, we are going to show how you can extend a SobiPro directory with XTDir Promoted Entries solution. 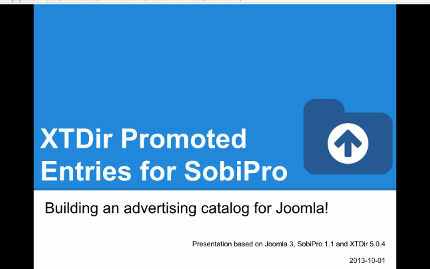 The presentation includes how to install XTDir Promoted Entries for SobiPro, and how to setup several Promotions type according different business requirements. In this presentation, we are going to show how you can extend a SobiPro directory with XTDir solution. The presentation includes how to install the full XTDir for SobiPro, and chapters for each associated modules and plug-ins.